In my network I have a no-break (UPS) system that implements the standard UPS-MIB (RFC-1628). What is the easiest way to start monitoring this device with PRTG? Are there any standard sensors or templates? 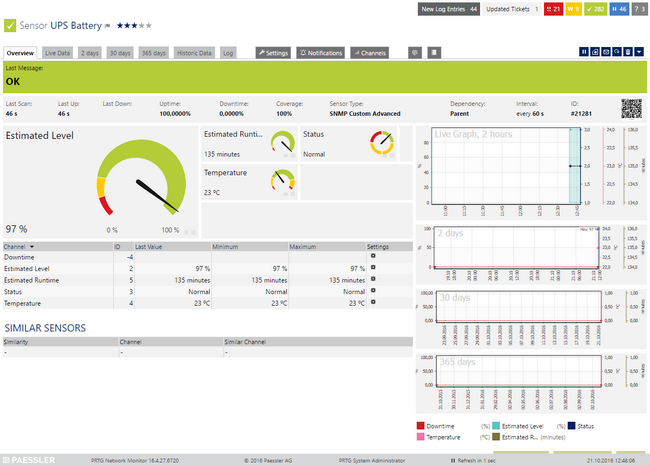 Yes, you can monitor Uninterrupted Power Supply (UPS) systems, with PRTG. Follow the steps described in this article to setup monitoring for an equipment that implements the standard UPS-MIB according to RFC-1628. The following sensor setup requires PRTG Network Monitor version 16.3.25 or later. The UPS you want to monitor needs to be reachable via ping. Your UPS systems are configured correctly. This means, that SNMP must be working on your device and that OIDs from the UPS-MIB need to be reachable. Download the required zip-archive here. Extract the archive to the PRTG program directory. By default, this is %Program Files (x86)%\PRTG Network Monitor\. If you want, you can skip the README file. See the Paessler Knowledge Base to learn more about how and where PRTG stores its data. In the PRTG web interface, navigate to Setup | Administrative Tools and click Go! in the Load Lookups section. 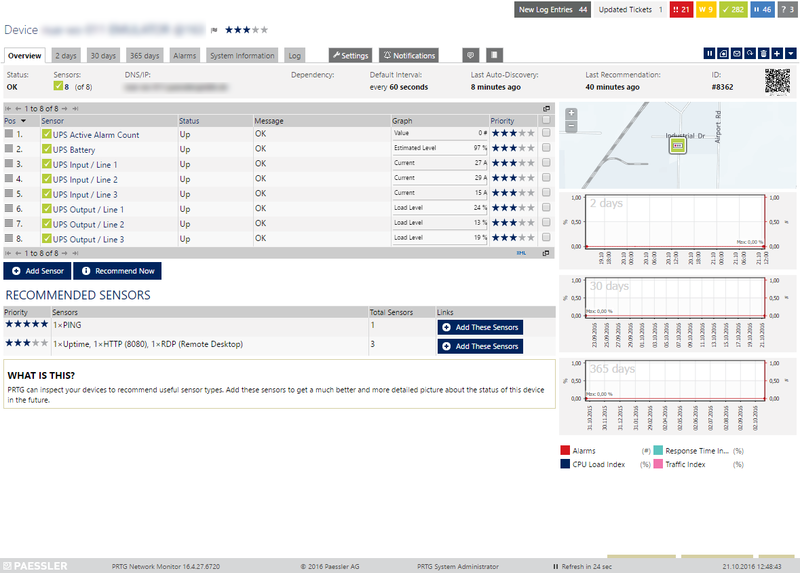 Create a new device in PRTG with the address (IP or FQDN) of the equipment that you want to monitor and configure its SNMP Credentials accordingly. Right-click your new device, select Run Auto Discovery With Template, and select the Custom UPS TableSensor from the list. Note: Using the auto-discovery with a dedicated Device Template is convenient here because it automates the creation of the dedicated UPS sensors organized in an SNMP Custom Table Sensor. The sensors should be deployed after a couple of seconds. You can adjust the Channel limits or lookups to your needs. Note: Please understand that we cannot provide in-depth technical support for custom sensors nor can we guarantee that the above described sensors will work on your systems. Use all components at your own risk. It is possible to troubleshoot the auto-discovery by inspecting the auto-discovery log. If you get entries like the one below ( NOT FOUND), this means that the required OIDs are not available. If you need some help with troubleshooting your SNMP sensor, see also the Paessler Knowledge Base article My SNMP sensors don't work. What can I do? One possible source for the UPS MIB: circitor.fr. Note: We do not guarantee that the content on that website is available nor are we responsible for its integrity. 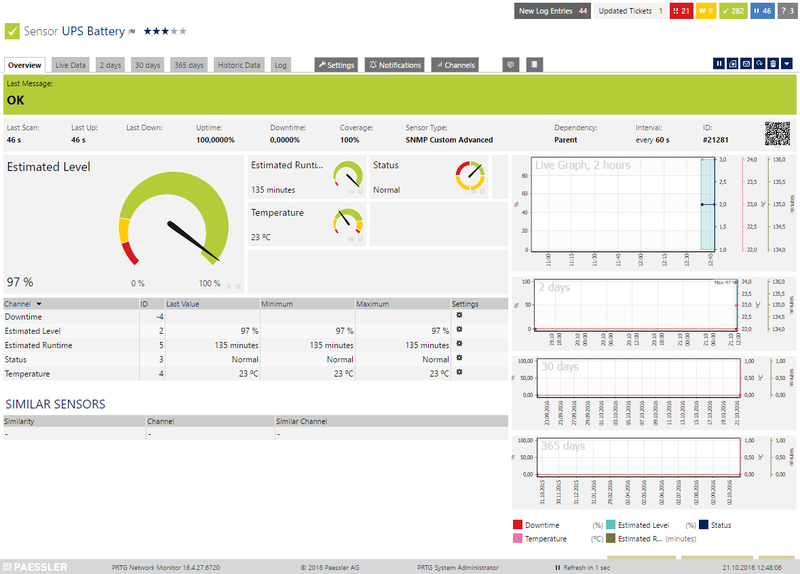 Paessler Knowledge Base: What can I monitor with the SNMP Custom Table Sensor? Paessler Knowledge Base: Can I use templates from SNMP Custom Table sensors?